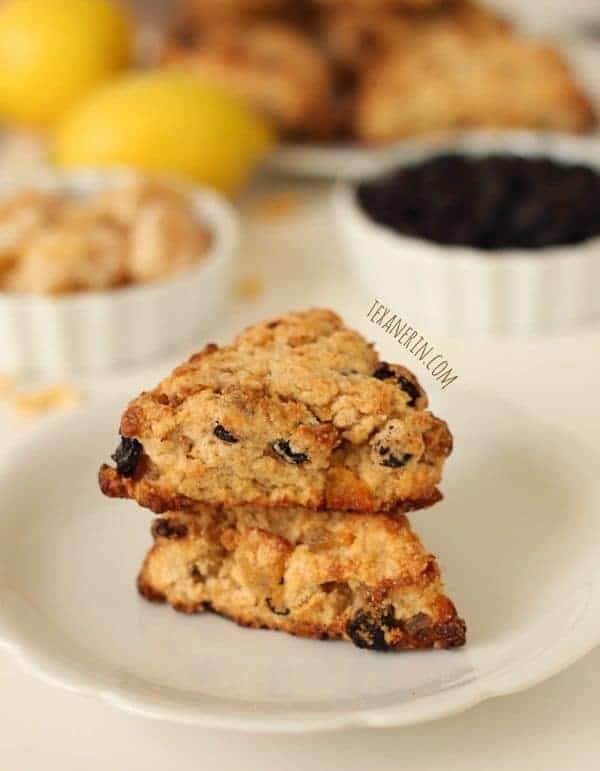 These healthy scones combine the classic flavors of blueberry and lemon with a little extra spice from crystallized ginger. My dear friend and talented baker Erin from Texanerin Baking has created these beautiful, guilt-free scones just for you while I enjoy a little downtime with my little babe. 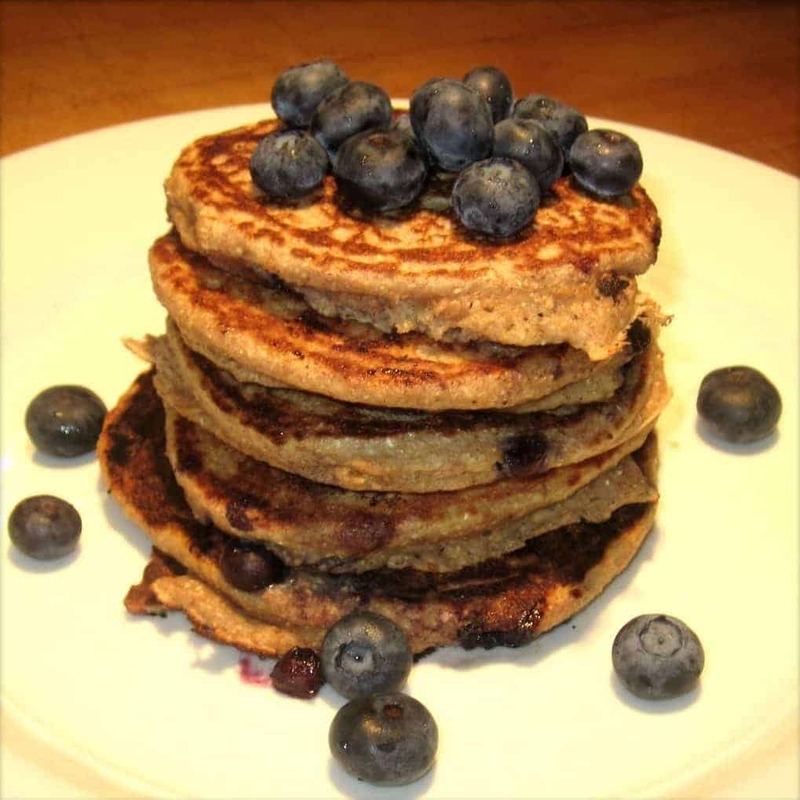 Erin’s website is full of whole grain and gluten free baked goods that you will love including Gluten Free Peanut Butter Brownies, Chocolate Avocado Smoothie and Banana Pancakes. Enjoy! Hi, everyone! I’m Erin and blog over at Texanerin Baking, which is all about healthier baking. I do a mix of 100% whole grain and gluten-free (usually grain-free!) goodies. I don’t have any dietary restrictions – it’s kind of fun to create healthier recipes that taste just as delicious as the not-so-healthy versions! I based these blueberry lemon ginger scones off of my chocolate orange scones. They’re one of my husband’s favorite baked goods ever, but I get tired of making the same scones time after time. So I jazzed them up with some new flavors! I don’t know about you, but after Christmas, I turn against all things wintry. I don’t want cinnamon, cloves, or cranberries. None of that! This is going to sound ridiculous, but I’m already yearning for summer berries. You can’t tell that these are 100% whole wheat. There’s enough lemon flavor to cover that up! So be sure not to leave out the lemon zest, extract, or juice! I also used white whole wheat flour, which has a milder taste (and all the nutrition!) of regular whole wheat flour. If you like, you can leave out the crystallized ginger or add powdered ginger. It’s a great touch but not necessary. These scones have the perfect texture – not at all muffin-like and not too dry. The secret is adding just enough liquid. If you add to much liquid, the scones will be more like muffins. On the other hand, if you don’t add enough liquid, the scones will be crumbly and fall apart. You want to mix them together just until they come together. If you’ve never made scones before, yours might not come out perfectly but with a little practice, your scones are sure to turn out heavenly. Thanks for having me today! If you’re ever in the mood for some more whole wheat or gluten-free goodies, I’d love for you to come visit me over on Texanerin Baking. In a large bowl, stir together the flour, sugar, baking powder, salt and lemon zest. With two knives or a pastry cutter, cut in the butter until it resembles coarse crumbs. Do not over process! Stir in the ginger and blueberries. Add the lemon extract and tablespoon by tablespoon, mix in the lemon juice. Just add enough so that the dough holds together. If you add too much lemon juice, the scones will come out muffin-like. Some days I need 3 tablespoons and sometimes I need up to 6. On a piece of parchment paper or Silpat, form a circle of dough, about 3/4" thick. Cut out 8 triangular scones. Place the scones a few inches apart on the parchment paper or Silpat and sprinkle the sugar over the top, if using. Place the scones about 2" apart. Bake until the scones are slightly brown, about 12 - 15 minutes. Remove the scones from the oven and let cool for 5 minutes on the pan. 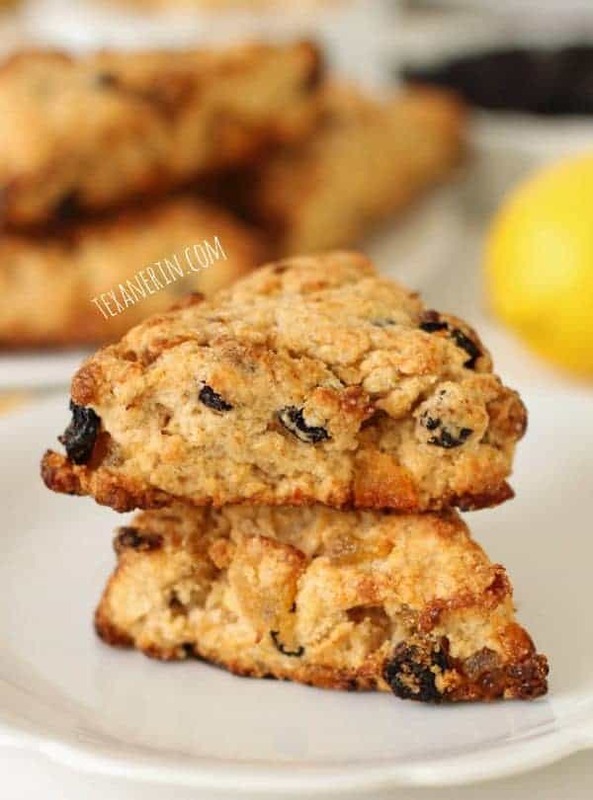 These scones are best the day of baking but if you have any left over, cover and store at room temperature for up to 3 days. 1/2 cup of crystallized ginger sounds like too much. Can you check and let me know? I would like to make these, but am concerned that this much ginger will be overwhelming. 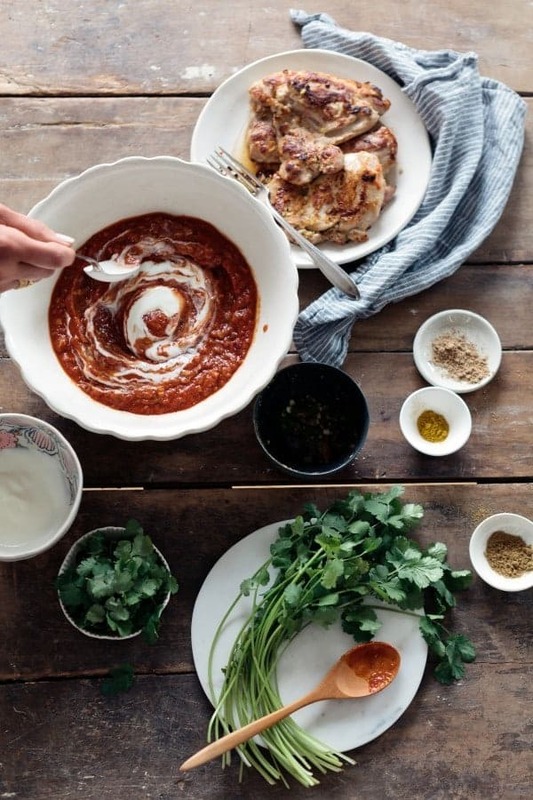 I actually didn’t write this recipe as it was a guest post. My suggestion if you’re worried is to do 1/4 cup then go from there. The issue is that there’s no “Right” or “Wrong” answer as it’s a matter of taste. For example, I love strong gingery flavors but others dont. Make sense? whats the recommended amount if I use fresh blueberries, which for some reason are inexpensive again in the northeast. Guess they’re in season in Chile! These look and sound absolutely lovely and I can tell just from the photos that their texture is spot on. Yum! I’m completely drooling over these scones, Erin! I’m glad you were able to have some down time too, Liz. Happy new year! You and me both Becca!! I hope you try the!! These scones look wonderful Liz! I love the fact that they are whole wheat and blueberry!! I hope you love them Layla!! YES I like the way you think!! Hooray for ginger!! Between the two of us, we create the perfect ginger balance! Just about to add ginger to a smoothie. Happy New Year my ginger loving friend! Lemon and blueberry just go together!! I love these Erin!! Aint that the truth!! Happy New Year Megan!! I am in full unseasonal berry mode right now, too! Can’t get enough. These scones are next on my list, for sure. Great guest post! Thanks to the freezer I eat berries year round!! Why should summer have all the fun? :) Happy New Year friend! Lemon and blueberries are one the greatest flavour combinations ever know to planet Earth! 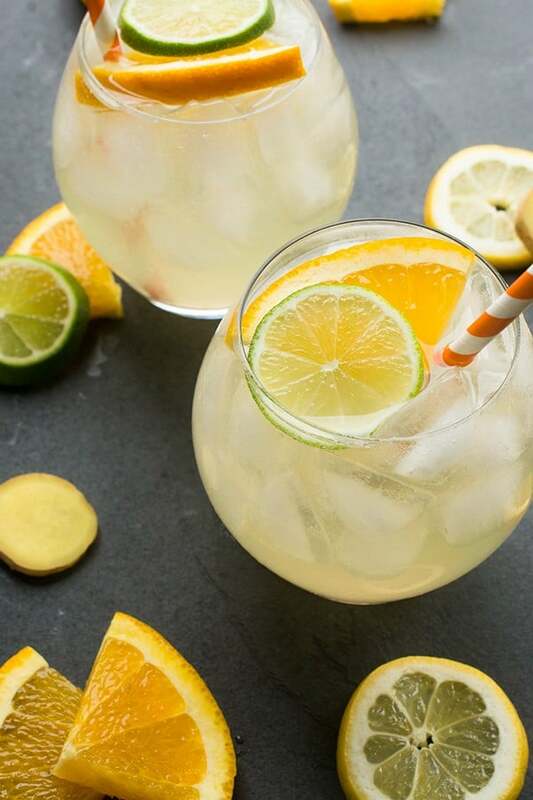 Love love love the idea of throwing a little ginger in there…genius! 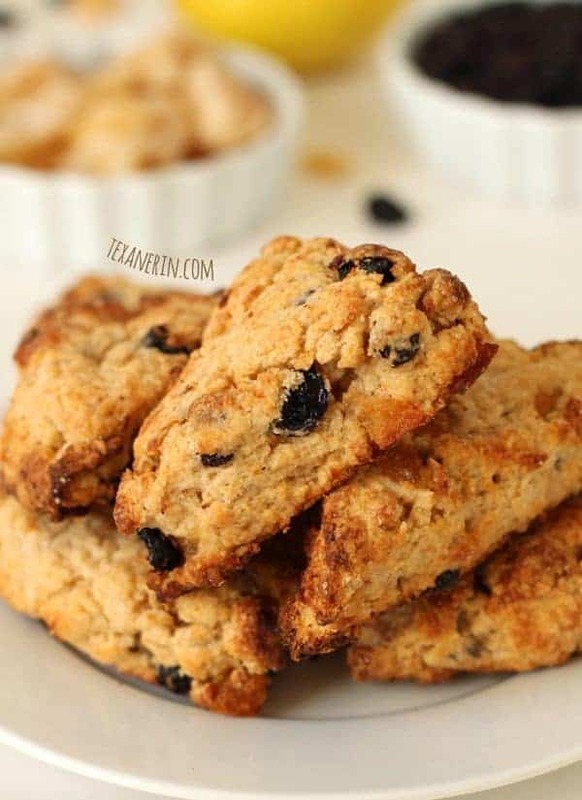 Scones are one of my fav’s and knowing that these are healthy makes me want one…right now.